George MacDonald was a prolific and talented writer of the 19th century. He was well-loved by many of his literary contemporaries and would serve as an inspiration to C.S. Lewis, Madeline L’Engle, J.R.R. Tolkien, G.K. Chesterton, and Oswald Chambers. Those who read John Eldredge’s books will find a fair sprinkling of MacDonald therein as well. 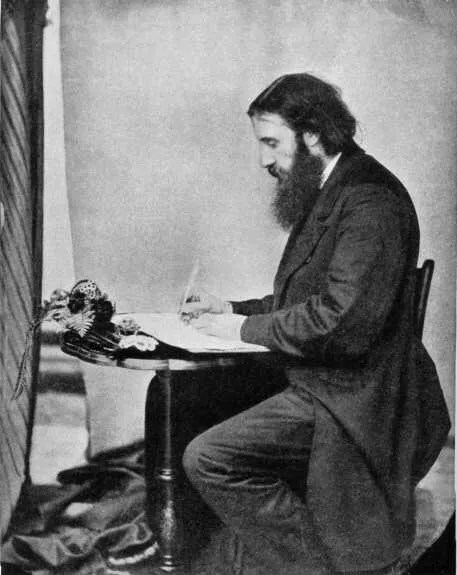 An image of George MacDonald working. Still, his writings are sadly under-read these days and this site is an attempt to rectify that situation. MacDonald’s works have become obscure for several reasons. One being the use of archaic language, another is the arcane references to poetic and literary works which are no longer familiar to us. My endeavor is to modernize his writings, while making as few adjustments as possible. Bringing the archaic and arcane language and grammar to contemporary form and providing annotations explaining arcane references within his works. I have completed a number of these books and am making these contemporary, annotated works available via Amazon in eBook form for $2.99/ea. I have not included DRM on any of the ebooks. Unspoken Sermons Series I, II, and III has a dedicated page with links to each individual volume here. Lilith, one of MacDonald’s last and darkest novels is available here. The Lost Princess: A Double Story (also known as The Wise Woman: A Parable), one of MacDonald’s most beautiful and allegorical children’s works is available here. The Princess and the Goblin, one of MacDonald’s children’s works and probably his best known as it was made into a movie several times over. The Light Princess, one of MacDonald’s children’s works, perhaps the most humorous. A Book of Strife in the Form of the Diary of an Old Soul, MacDonald’s best known poetry, written daily as an interaction with God after two of his adult children died in the same year. As I work through each volume I publish them, but it is not my intent to leave them as such but to revise them with future editions (which will be a free upgrade for existing owners) which will further refine language and grammar and add or revise the explanatory annotations. I would welcome feedback on where and how I may improve these volumes. “I know hardly any other writer who seems to be closer, or more continually close, to the Spirit of Christ Himself!” – C.S. Lewis. “I have never concealed the fact that I regarded him as my master; indeed I fancy I have never written a book in which I did not quote from him. But it has not seemed to me that those who have received my books kindly take even now sufficient notice of the affiliation.” (George MacDonald: An Anthology, pg. xxxii). “…it is a striking indication of the trend and shallowness of the modern reading public that George MacDonald’s books have been so neglected.” – Oswald Chambers (author of the popular devotional, My Upmost for His Highest), Christian Discipline Vol. 1 (1934). “…in a certain rather special sense I for one can really testify to a book that has made a difference to my whole existence, which helped me to see things in a certain way from the start; a vision of things which even so real a revolution as a change of religious allegiance has substantially only crowned and confirmed. Of all the stories I have read…it remains the most real, the most realistic, in the exact sense of the phrase the most like life. It is called The Princess and the Goblin, and is by George MacDonald…” – G.K. Chesterton. “[George MacDonald was] one of the most remarkable writers of the nineteenth century.” – W.H. Auden (as quoted by Nick Page in his annotated Phantastes). Other Fans: Madeleine L’Engle, John Eldredge, J.R.R. Tolkien, Thomas Talbott. “…a grievous experience I had when some of George MacDonald’s sermons were published in 1976 (Creation in Christ). I had relished three of MacDonald’s novels and the Anthology compiled by C.S. Lewis. Then I read this sentence, and the budding friendship collapsed: ‘From all copies of Jonathan Edwards portrait of God, however faded by time, however softened by the use of less glaring pigments, I turn with loathing’ (Creation in Christ, P. 81). I was-stunned. George MacDonald loathed my God!” – John Piper. Those who were contemporaneous with MacDonald and had friendships with him I have included herein rather than under fans, though some (all?) of them may be fans as well. In addition to those who were fans or critics, there are many who have been influenced by him…whether they were fans per say, I cannot say. That MacDonald’s writings are influenced by these individuals/groups does not necessarily indicate his agreement with them. John Bunyan (The Pilgrim’s Progress, Grace Abounding). Dante Alighieri (The Divine Comedy). Emmanuel Swedenborg (an inventor and scientist who went on to found the religion of Swedenborgianism). 1855 – Within and Without, a Poem. 1858 – Phantastes: a Faerie Romance for Men and Woman. 1864: The Portent: a story of the Inner Vision of the Highlanders commonly called the Second Sight. 1865 – Alec Forbes of Howglen. 1867 – Annals of a Quiet Neighborhood. 1867 – Dealings with Faeries. 1867 – Unspoken Sermons. 1st Series. 1868 – The Seaboard Parish. 1870 – The Miracles of Our Lord. 1871 – At the Back of the North Wind. 1871 – Ranald Bannerman’s Boyhood. 1871 – Works of Fancy and Imagination. This work consists mainly of reprints of earlier works. 1872 – The Princess and the Goblin. 1872 – The Vicar’s Daughter. 1873 – Gutta Percha Willie: the Working Genius. 1876 – Thomas Wingfold, Curate. 1876 – St George and St Michael. 1876 – Exotics: a Translation (in verse) of the Spiritual Songs of Novalis, the Hymn Book of Luther and other Poems from the German and Italian. 1877 – The Marquis of Lossie. 1879 – Paul Faber, Surgeon. 1880 – A Book of Strife, in the form of the Diary of an Old Soul. 1882 – Weighed and Wanting. 1882 – The Gifts of the Christ Child and other Tales. This work would later be republished under the title Stephen Archer and Other Tales. 1882 – A Dish of Orts. 1883 – A Threefold Cord. Poems by Three Friends, edited by George MacDonald. 1883 – The Princess and Curdie. 1885 – The Tragedie of Hamlet – with a study text of the Folio of 1623. 1885 – Unspoken Sermons. 2nd Series. 1886 – What’s Mine’s Mine. 1886 – Cross Purposes and The Shadows: Two Fairy Stories. 1887 – Home Again, a Tale. 1888 – The Elect Lady. 1889 – Unspoken Sermons. 3rd Series. 1890 – A Rough Shaking, a Tale. 1891 – There and Back. 1891 – A Cabinet of Gems, cut and polished by Sir Philip Sydney, now for their more radiance presented without their setting. 1892 – The Hope of the Gospel. 1893 – Heather and Snow. 1893 – Poetical Works of George MacDonald. 1895 – Lilith, a Romance. 1897 – Rampolli: Growths from a Long-planted Root, being translations chiefly from the German, along with A Year’s Diary of an Old Soul. 1897 – Salted with Fire, a Tale. 1898 – Far Above Rubies.